Hello, everyone. Do you know who this is? This is Erin Weyen, and she's definitely one of the coolest girls we know, and not just on the fashion scene. She's super-cute, edgy, and she has the coolest hair ever. In this photo, she's following our "Tights as Pants" rules (her idea!) perfectly. 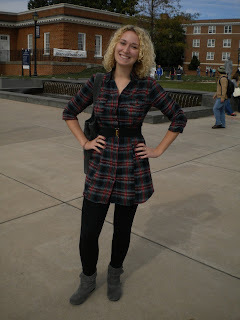 Look for her around campus for your next style inspiration!